You had me at the hook. From as early as Brian Blake can remember, music spoke to him through the “hook”, a catchy, emotionally impactful, and undeniably addictive melody and/or lyric that he could never escape. Today, that instinct is the catalyst behind a self-realized dream to write and produce hook-driven music that empowers Brian to share his inspired feelings with the masses. Brian quickly acknowledged the hooks in his favorite music at a young age. Raised in the suburbs of Detroit, Brian’s parents brought him up listening to the classics of the 1960’s and 70’s from Motown to The Beatles along with the most contemporary pop music of the 1980’s. Not long into his childhood, Brian began to notice himself constantly hearing melodies in his head and singing hooks he didn’t recognize from any songs in particular. At age 15 when Brian got his first guitar, he headed straight up to his bedroom and began writing his first song despite not knowing how to play this new instrument. Brian founded the band Roundabout Way in East Lansing, MI and played in the band for six years. Decades later, Brian has obsessively written and recorded 1000’s of songs and hooks, confidently sharing his art with anyone who would listen. 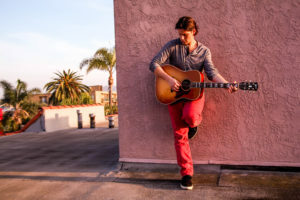 Brian moved to LA in 2006 with his sights set high to work professionally as a Record Producer and Songwriter. Since 2011, Brian has dedicated his full-time effort and heart into building a sustained career in music. Over the past several years, Brian has licensed hundreds of songs for major TV/Film placements, written the catchiest of jingles for commercials and programs like The Ellen Show, composed music for TV series such as Deadbeat on Hulu, and produced many talented artists on their way up. In 2017, Brian created RAW Records Ltd., a boutique record label focused on developing artists and music around the “hook”, distributing singles for airplay and audio/visual placements.